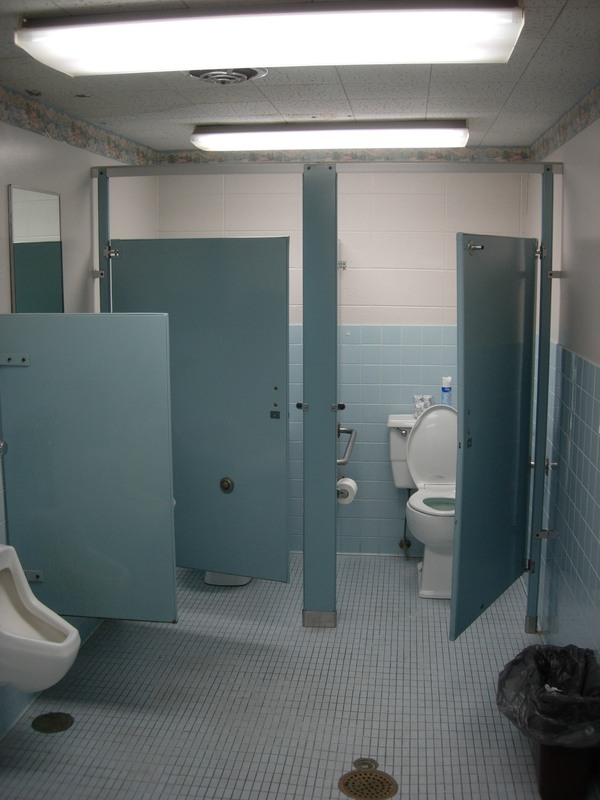 The restrooms at Grace Baptist Church in Plymouth have been an issue for a number of years. They were small and the decor had become dated. Off and on for almost 10 years we have visited this subject with the Church, but we had been unable to find a suitable solution. The restrooms were block wall construction built between the Sanctuary and the classrooms and were surrounded by mechanical infrastructure. 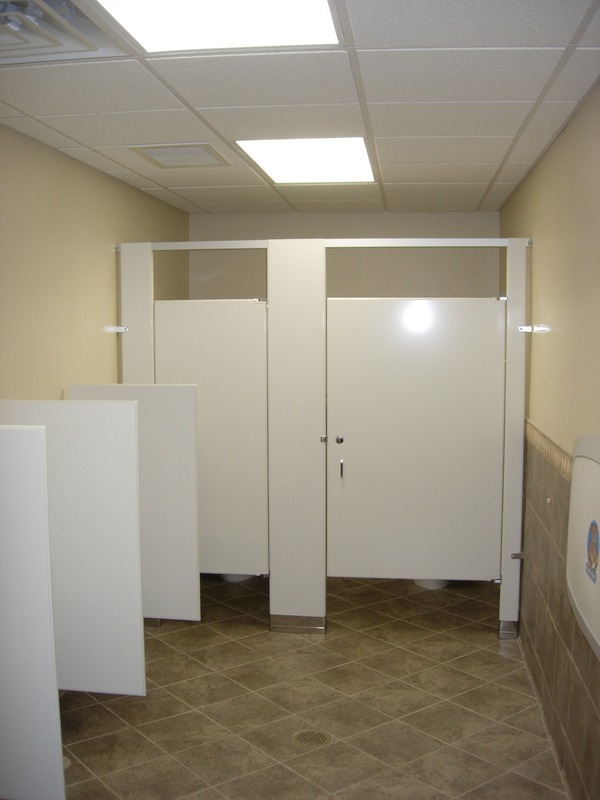 The quandary resurfaced last year when Pastor Elliott asked that we take a fresh look at the restrooms. 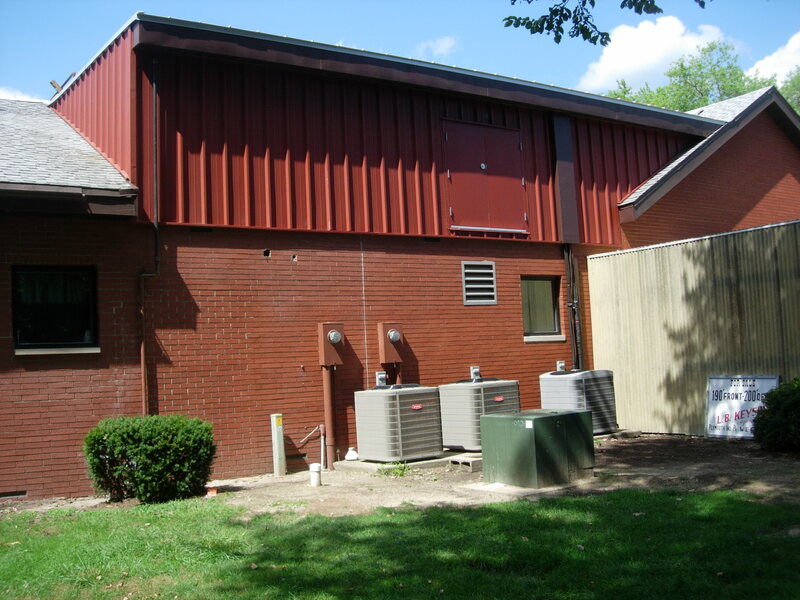 The Church was also experiencing some mechanical problems with two of their five air handling units at that time. The two units in question were in the mechanical space between the restrooms. By including the replacement of those two units in the project, we were able to open up new possibilities. Even with this, we went through 11 new floor plans before we found one that pleased the Church Building Committee. The final plan gutted both restrooms and the mechanical room between them. A second floor mechanical room was added allowing infrastructure to be moved up, freeing additional floor space. This also provided some additional storage for the Church. Over the years, the original galvanized water pipe from the street had become corroded and water pressure was insufficient to serve multiple fixtures simultaneously, so new water lines were installed from the street to correct this problem. We updated the electrical circuits in this portion of the building and we installed a new in-line water heater to increase capacity while reducing energy consumption. The men’s room was widened slightly to allow ADA standards to be met. There is now a full 5′ turning radius in the room. 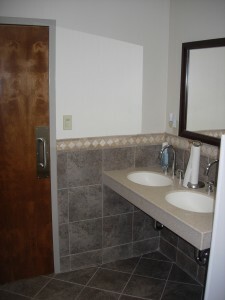 It was also lengthened, closing an existing exterior door and allowing room for a larger sink and an additional urinal. 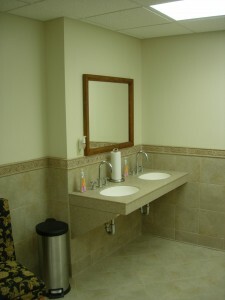 The women’s room benefited the most, not only gaining additional space to meet ADA standards, but by taking most of the former mechanical room space into the women’s room, there is now generous floor space, full size stalls and a larger counter with two sinks. There was even room to put a small table and a couple of chairs. 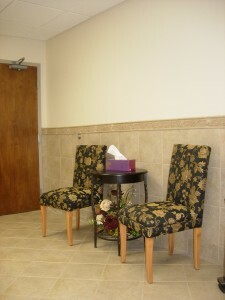 Pam Clay of Clay’s Flooring & Interiors, Inc. in Rochester helped with the tile design. She provided color boards that included different tile, tile patterns and tile borders for each room. 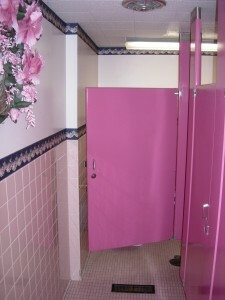 Using that as a basis, the Church chose colors for walls and toilet partitions. A last minute upgrade to solid surface sinks and countertops was made. The Church found a source for designer faucets which allowed them to upgrade those fixtures at no additional cost. They also found baby changing stations which we installed. To create the second floor space without detracting from the existing building, a shed roof was employed using a 1/2:12 slope and standing seam roof. This allowed the second floor addition to remain hidden behind the existing trusses and invisible from the front entrance on the north side of the building. Butler Manufacturing Company metal wall panels were used to match those used on the Grace Baptist School just across the creek. This was an economical solution that blended well with the existing brick and emphasizes the ties between the Church and School. An access door was included at the second floor for equipment maintenance. The final kicker to this was that we had a two month window in which to work as there was a wedding scheduled in the Church and we had to be substantially complete in time for that event. Sometimes the smaller projects are the most difficult under these conditions. There were many trades required to work over the top of each other to meet this schedule, some of which were interdependent, requiring a portion of one contract to be completed before the next could begin. Through it all the team we assembled worked well together and while we were not 100% complete for the wedding, we were substantially complete and the restrooms, including the plumbing and HVAC were operational for that day. Thanks to Espich Siddall Plumbing, Matt Peregrine Heating & Air Conditioning, Michiana Contracting, McKinley Painting, Inc. and H&D Creamer.